There are several annoying things about Tom going to India on business. The main one being that he’s there and I’m not. On the plus side, he’s very good at returning laden with spices. Though the latest offering was in fact a gift from, Anil, a friend of his who is evidently very knowledgable about spices indeed. Because the two tins he brought back are filled with the most sweet-smelling, potent saffron I’ve ever had the delight of cooking with. A totally different spice to the shrivelled threads that rattle round the Tesco’s pots of spices. 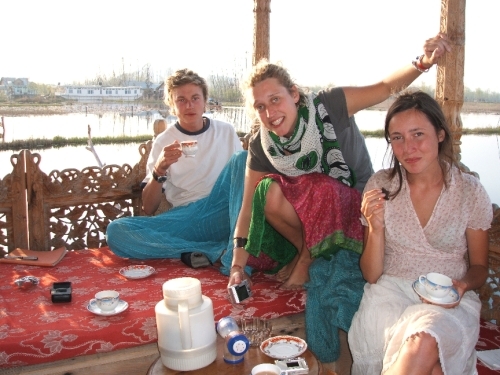 My own, very limited, knowledge of buying saffron comes from a stay in on houseboat on Dal Lake in Kashmir. It’s an extraordinary place. 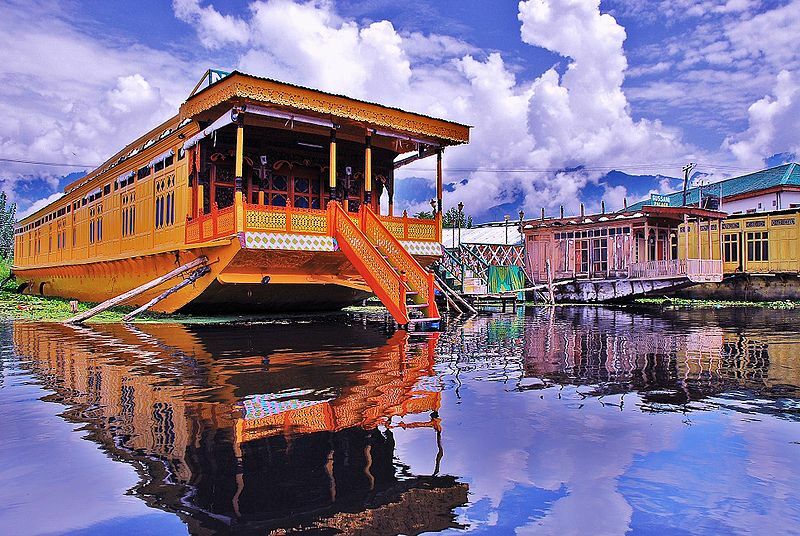 In the times of the British Raj, sweltering colonialists used Kashmir as a retreat. But they weren’t allowed to build on the land, so instead invested small fortunes into the most intricate ‘floating palaces’, covered in ornate carvings, with sun terraces and servants’ rooms. 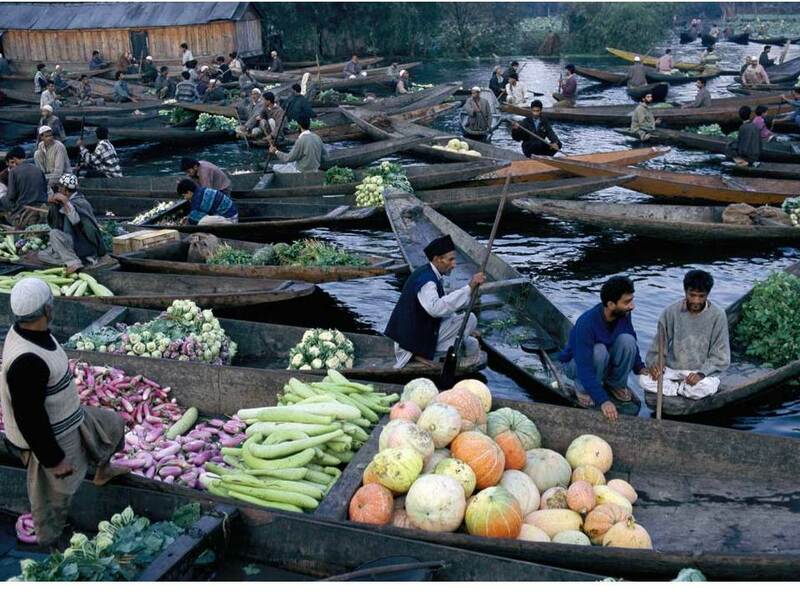 Still, lots of the trade is done on Dal Lake. From early-morning vegetable markets to floating tuck shops and jewellery boats visiting the few houseboats known to be housing tourists. 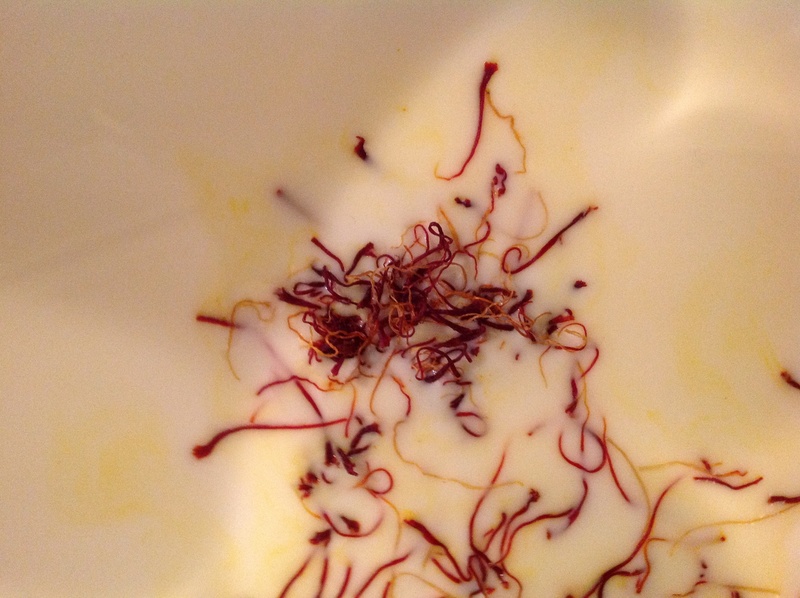 On several occasions, men selling saffron arrived, and set about long explanations on the different grades of saffron. It involved putting threads of saffron onto textbook paper, and dripping water onto them, to demonstrate how the expensive saffron turned a fiery red colour, and dyed the water droplet an intense yellow colour…while the cheaper saffron didn’t give out a more hay-like, weaker hue. There are expensive saffrons, cheaper saffrons, and even fake saffrons made out of dyed-dried grass, and even dyed-dried paper which dissolves in dishes. So you can imagine that buying saffron is a minefield. 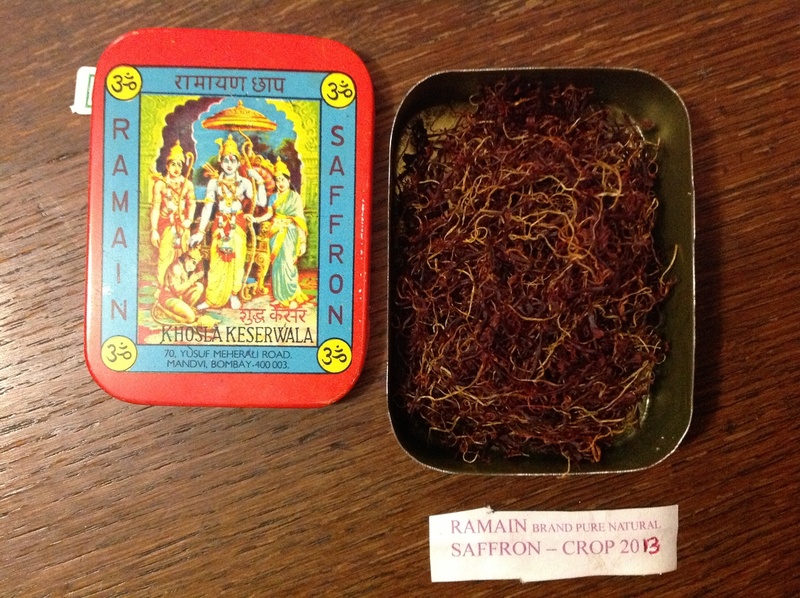 Which makes me even more delighted to have acquired not one, but two tins of quite incredible saffron. 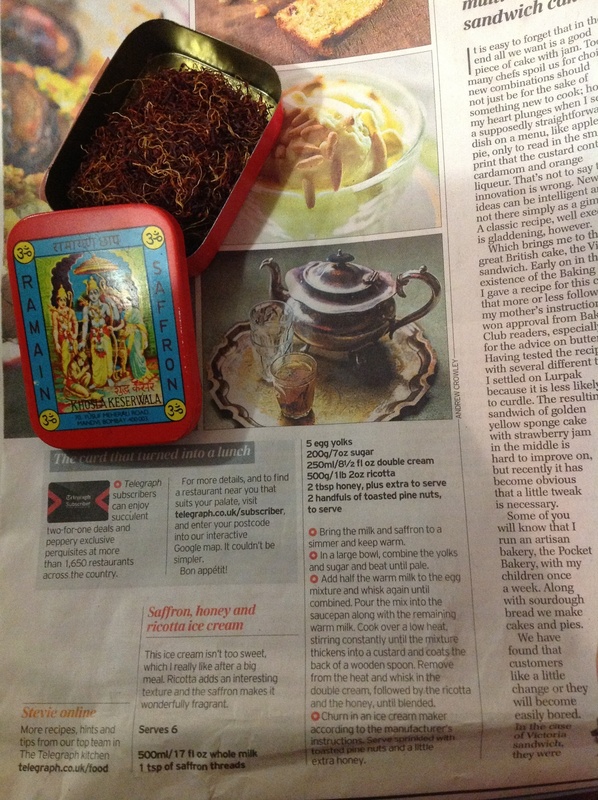 Perfect timing-as the Saturday Telegraph featured a double spread of saffron recipes by Stevie Parle. 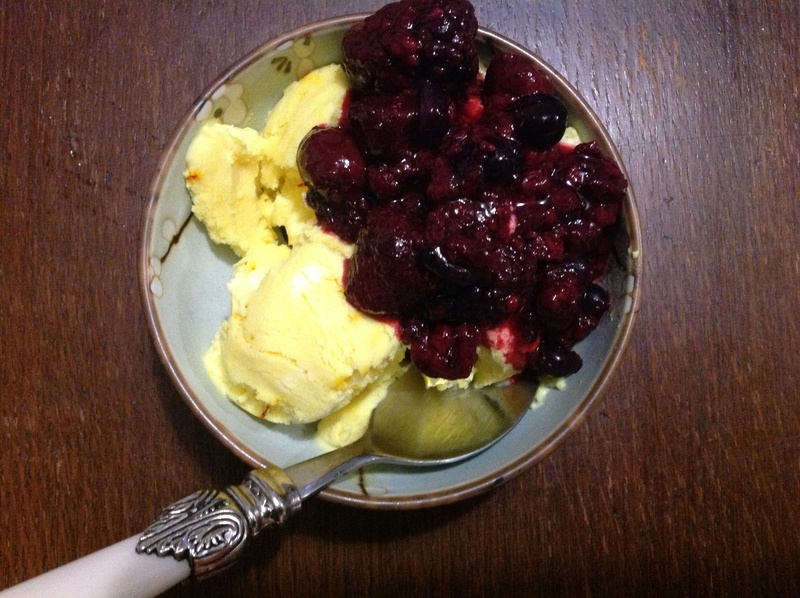 I decided that the best starting place would be the saffron ice cream. One of the best ice creams I’ve ever tasted was matcha ice cream, which has deliciously dry, astringent, vegetal flavours. My next favourite ice cream would always be cream fruity flavours, with chocolatey-treacly sweet ice creams being my least favourite flavour. So – you may well imagine that the saffron flavour was perfect. The ideal way to finish a meal. Well-balanced, not too sweet, subtle, unusual and exotic. A recipe I’m putting online, because it’s one to make again, and I’m scared the scrap of newspaper might get thrown away…. 3. Add half the warm milk to the egg mixture and whisk again until combined. Pour the mix in the saucepan along with the remaining warm milk. Cook over a low heat, tiring constantly until the mixture thickens into a custard and coats the back of a wooden spoon. Remove from the heat and whisk in the double cream, followed by the ricotta and the honey, until blended. 4. Churn in an ice cream maker according to the manufacturer’s instructions. [I put it in the freezer and stirred occasionally. Sadly not too soft-scoop though!]. 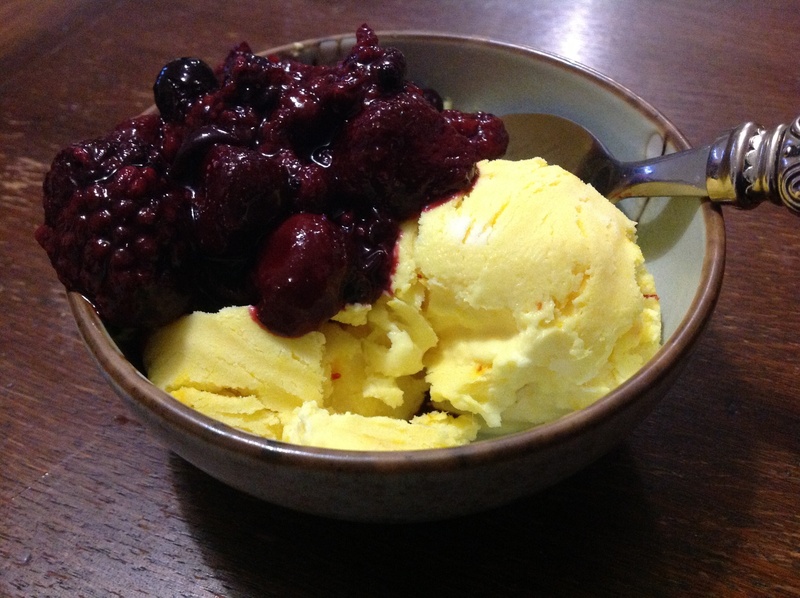 Stevie Parle suggested serving the ice cream with “toasted pine nuts and a little extra honey” – I thought that fruit compote was just delicious. As a fellow lover of pretty much all icecream this has sadly left me drooling. To make amends, please save me some.